One class session with rhetoric professor Stephanie Kelley-Romano in 2015 was enough to turn Claire Sullivan ’19 into a rhetoric major. Kelley-Romano then struck up a discussion encompassing heteronormativity, gender roles, and who’s excluded from a worldview like RaeLynn’s. “She just went off on the absurdity of the rhetorical implications of this music video,” says Sullivan of Montville, N.J. The class “made me want to be a rhetoric major because she just had so much passion and enthusiasm for it. 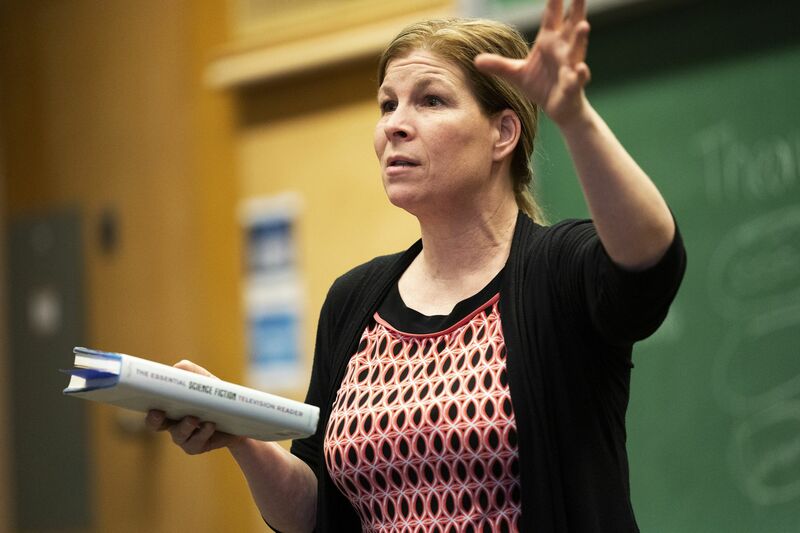 Praised as a teacher who’s exacting, empathetic, authentic — and passionate about her field — Kelley-Romano has received the college’s 2019 Ruth M. and Robert H. Kroepsch Award for Excellence in Teaching. 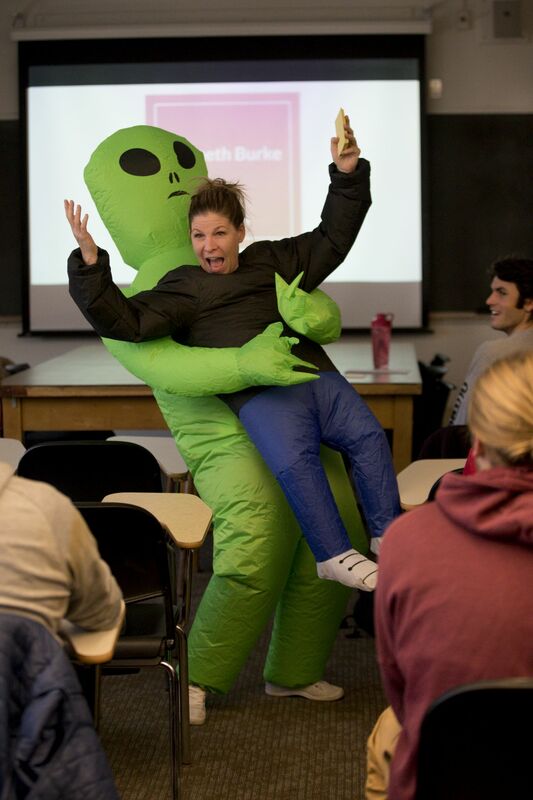 Associate professor and chair of the rhetoric, film, and screen studies department, Kelley-Romano is known at Bates and beyond for her professional focus on topics in the popular consciousness — the rhetoric of television, conspiracy theories, and abductions by space aliens, to name a few. Her biennial course on presidential campaign rhetoric is built around a mock campaign that affords an intensely hands-on, multidisciplinary experience for students. 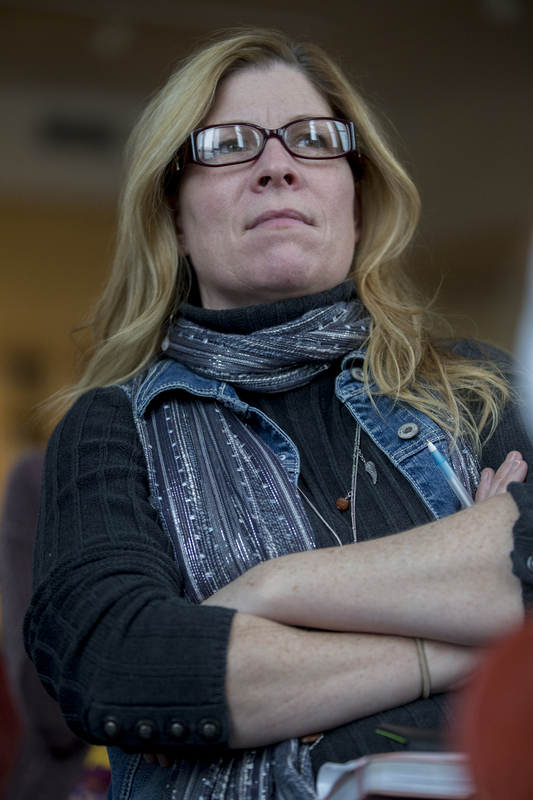 She has led public workshops on spotting fake news, analyzed for the local newspaper a debate between candidates for Maine’s 2nd District congressional seat (including Jared Golden ‘11, who ultimately won), and, with math professor Meredith Greer, she is modeling how conspiracy theories spread. “Rhetoric allows us to understand how realities are created,” says Kelley-Romano. “Why we call someone a survivor, as opposed to a victim, matters. It matters who we define as terrorists. The way we criminalize drug use by some but construct it as a health crisis when it affects other people, matters. “I love watching students gain confidence and skills,” Kelley-Romano says. In Kelley-Romano “there’s an element of genuineness” that’s uncommon, says Sullivan. “She lets us see who she is as a person.” For example, Kelley-Romano’s sons, 16-year-old George and 14-year-old Richie, are no strangers to Pettigrew Hall (and they also help keep their mother in tune with pop-culture trends). Some of that empathy may be traceable to Kelley-Romano’s undergraduate experience. A first-generation-to-college student at Emerson University, she took away a certain understanding of the uncertainties, insecurities, and feelings of isolation that can come with being a first-gen. She’s not shy about putting that understanding to work. None of which is to suggest that she is a pushover. “She wants, probably demands, that her students excel,” Nero says. “She sees her role as giving them the tools to excel, and she thinks a lot about that. A 2017 graduate, Gabe Nott experienced those high expectations as he honed his senior thesis under Kelley-Romano’s guidance. Now a New York City resident, Nott was writing about the TV program Last Week Tonight, hosted by comedian John Oliver, and the implications of news-focused comedy for civic discourse. “It took me a while to figure out my argument for my thesis,” says Nott. “Every time I thought knew what angle I was going to take, she’d come back with a question I wasn’t able to answer. Honestly, it was pretty frustrating. Sullivan took the fall 2018 edition of Kelley-Romano’s campaign rhetoric course. The mock campaign involves students in just about every aspect of a campaign that involves communications — which is pretty much all of it, from developing a platform to writing ads and speeches to holding debates to mounting a crisis response. Sullivan says, “It got us thinking about how we talk about identities, and how those identities are perceived and portrayed to a greater public.” Developing candidate personas — their backgrounds, beliefs, relationships — reflected an important emphasis in the Bates approach to teaching rhetoric: an understanding of intersectionality, how different aspects of identity relate to one another and how they are treated in communications. Four years after the RaeLynn revelation, Kelley-Romano advised Sullivan on her senior thesis, which looks at the role of conspiracy rhetoric in the Fox News coverage of the Brett Kavanaugh hearings — a research project they hope to publish together.